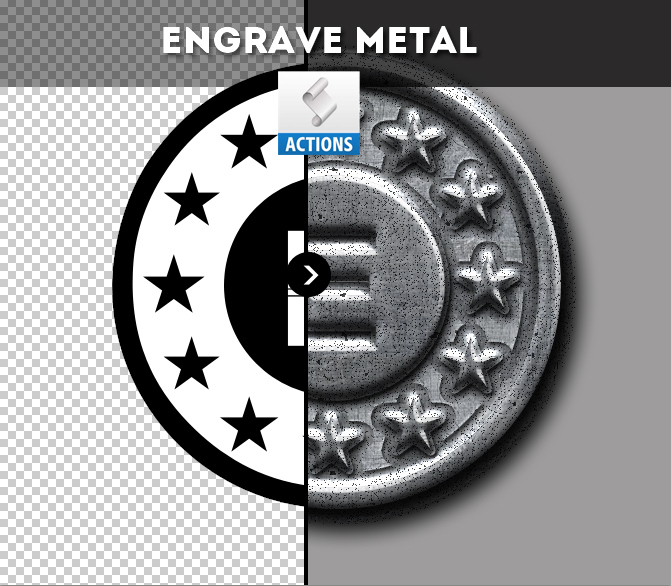 Learn how to create a metal coin in Photoshop using some basic layer styles. For the coin center image I will use the emboss filter that will add a 3D effect. You will also get the free coin PSD mockup file to create your own coins with minimum effort with the use of smart objects. Simply add your image inside the smart object and save. Start by creating a background; you can use any texture you want for the background, I decide to use a dark brown leather texture that you can find here. Use the Path Selection Tool to select the second circle shape inside the Circle 2 Layer and press Subtract from shape area. Let's add some decorations that every must have; for that purpose I will use my Circle Photoshop Shapes. Inside the CSH file you will find star circles, dotts circles and so on. Plentry to choose from. So add the decorations that you like. 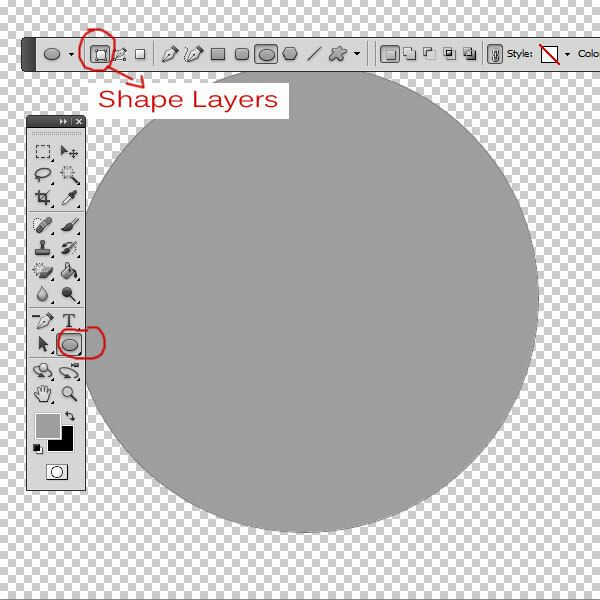 Now we have to add some layer styles to the Circle 2 Layer and to the Start Dots Circle Shapes. Set the Fill of both layers to 0%. You can use some of these amazing Letterpress and Emboss Photoshop Styles with small adjustments. After small adjustments especially for the Circle 2 Layer your result should look similar to this one. You can download the PSD file to get the exact layer styles and other settings. I will use this girl portrait(the original image is no longer available) to create a bas-relief effect in the center of the image. I will explain in just a few quick steps the process. Inside the PSD file you will find a smart object that you can use to add your own image. So open the image and desaturate it to obtain a black and white effect; cut the image into a circle shape like shown in the preview. Go to Filter > Stylize and choose Emboss using these settings. Set the Blend mode of this layer to Overlay; you can duplicate the girl layer and set the opacity to around 50% or less to obtain a bigger contrast. You can add further details like some text, year, etc. Add also emboss layer style to all the added items. The only thing left to do is to texturize the coin using a metal texture or gold texture. I will use this grunge metal texture with a Overlay blend mode. You can desaturate a little the texture or change the color tones using Hue/Saturation adjustment. Add Drop Shadow effect, add some light and shadow effects and this is it, you have a pretty nice coin effect made in Photoshop using some simple techniques. You can now DOWNLOAD PSD FILE(5MB) and inside you will find all the layer styles intact and also an easy to use smart object called ADD YOUR IMAGE INSIDE. Simply double click on the smart object thumbnail and a new PSD file will be opened with a new smart object; make the same steps until you get to the image. Now simply replace with your own image and save and close all the smart objects to see the results. 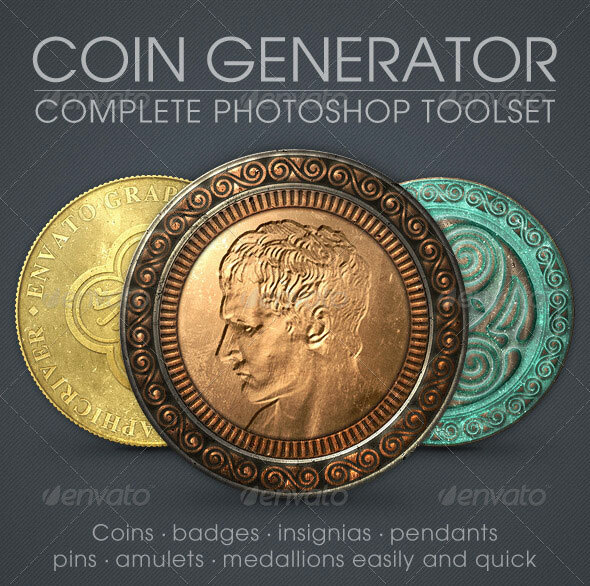 Here are some examples of what you can create using this coin photoshop tutorial; if you want to obtain more professional and realistic coins you can try this amazing Photoshop Coin Generator that you can purchase from graphicriver. Here you have some premium Photoshop actions that you can use for creating great looking metal effects with just 1-click. Easy to use and customize. 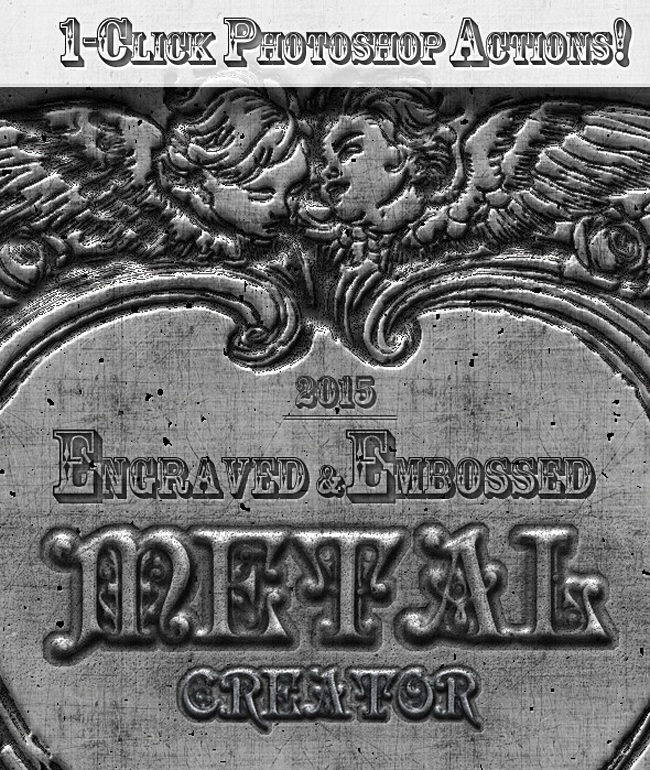 11 comment(s) for "Create a Metal Coin in Photoshop"
A fully editable dollar photoshop template. You can customize ALL texts, signatures, values, codes, pictures keeping the original styles. You can also place your own face in front side, and another picture in back side. You can create engrave effect for your photos. 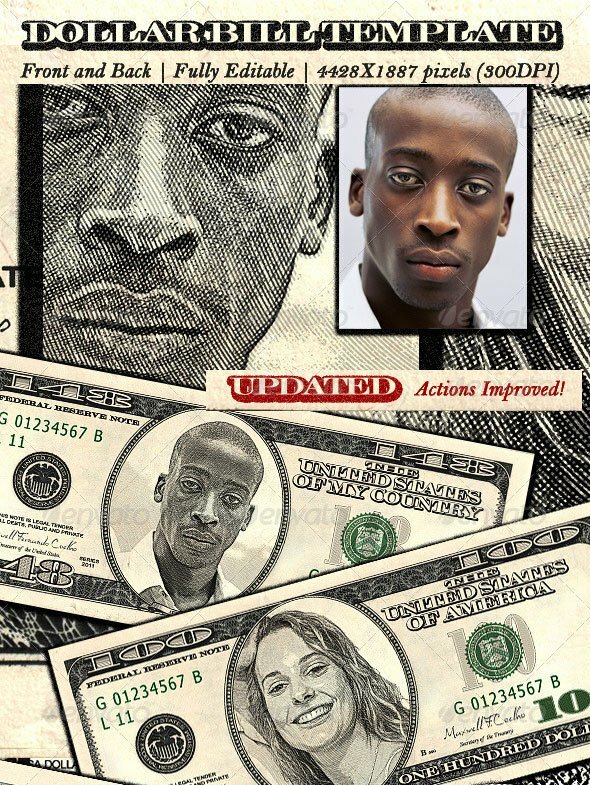 This is a set of 7 Photoshop Layer Styles totally identical to those of the dollar bill. 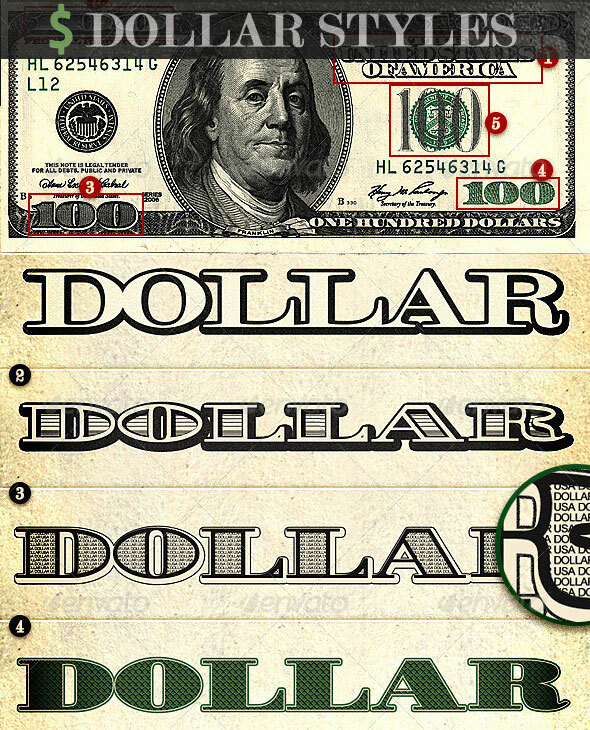 Add Photoshop money layer styles to your text or shape. While I appreciate your tutorial, I cannot get past step #1, or 2. I am using a transparent background, and trying to make the first circle, but nothing is filling in, it's only making a selection. For this tutorial you have to know how to work with shapes, so I guess it is not for a complete beginner.